Medicowesome: How is Visual Contrast achieved? How is Visual Contrast achieved? Let us discuss Visual contrast today. This question has haunted me for a long time. Let's start with the basics, the cells in various layers of retina and their function. It is a rod or cone. It detects light. 2. What is horizontal cell? 3. 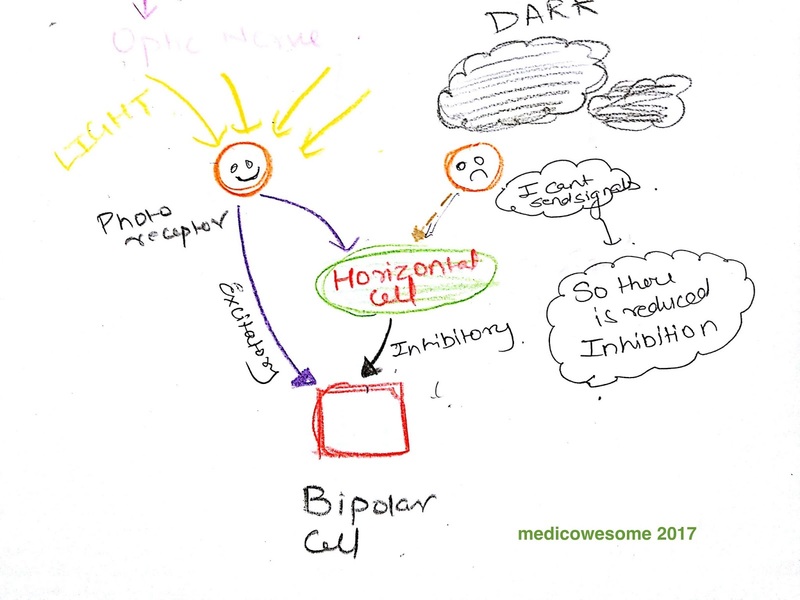 What is bipolar cell? It transmits information from photoreceptor to ganglion cells. Now, lets come to the details. 4. 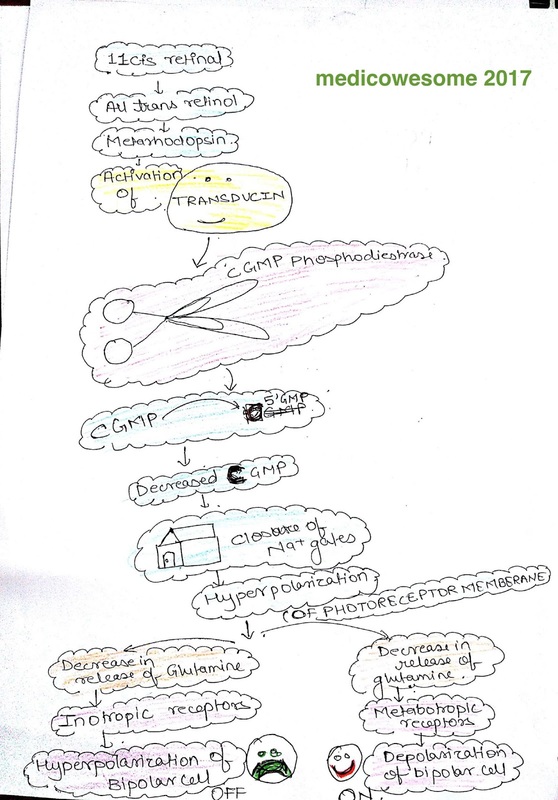 What are metabotropic receptors? 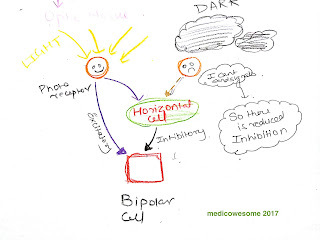 First of all what you must understand is Metabotropic receptors and Inotropic receptors are receptors present on bipolar cells. They recieve stimulas from photoreceptors (mostly decreased glutamate is the stimulas). 6. Receptive field - What is it? It is a region of retina where if the light falls it is going to alter the firing of neurons. 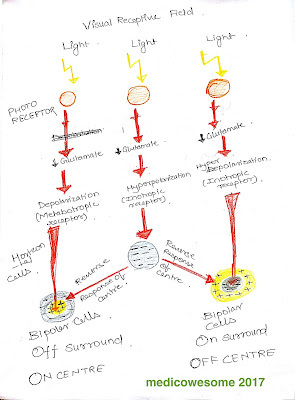 (By firing I don’t mean guns :P) It means the action potentials generated and transmitted by the photoreceptors. So each cell has a characteristic receptive field. It can be as small as a dot or as large as this page itself. But don't limit this concept to a photoreceptor only. Almost all sensory cells example in somatosensory system or in auditory system possess a receptive field. the “center” and a concentric ring, the “surround”, each region responding oppositely to light. Coming to the crux of the topic i.e. Visual Contrast. How do the things we have discussed so far help us achieve that? 2. 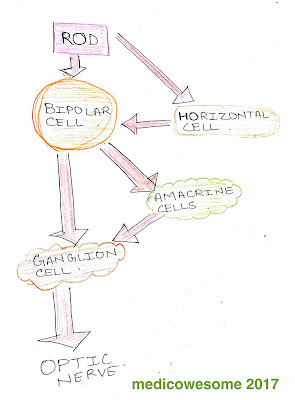 Excitation of Some Bipolar Cells and Inhibition of Others — The Depolarizing and Hyperpolarizing Bipolar Cells. 1. How does lateral inhibition help? First: It does not allow the signal to spread through the dendritic and axonic trees. Hence point to point transmission occurs. Second: The direct and indirect pathways accentuate each other. This can be easily understood. Photoreceptor sends excitatory signals to bipolar cell. But the adjacent photoreceptor sends a inhibitory signal through the horizontal cell. Mostly these two neutralize each other so no net stimulus is transmitted to bipolar cell. But If the adjacent cell is unstimulated by light, It will not inhibit the excitatory signals transmitted by the photoreceptor which is stimulated by light. Hence it will allow excitation of bipolar cell. 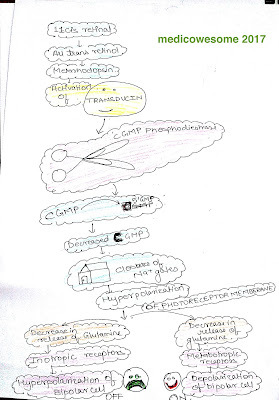 This allows extra excitation of bipolar cell. We get a better contrast. The area which is dark remains dark. But the area which is bright becomes even brighter. This is what visual contrast is all about. The fun part of all this is, a lot of visual illusion make use of this principle. Do google "Simultaneous Contrast" :) . 2. 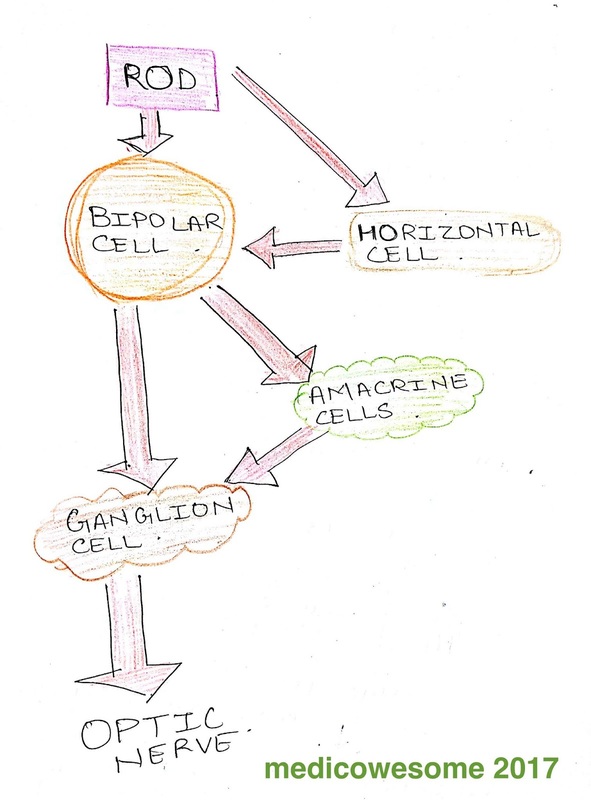 How do different Bipolar cells help? 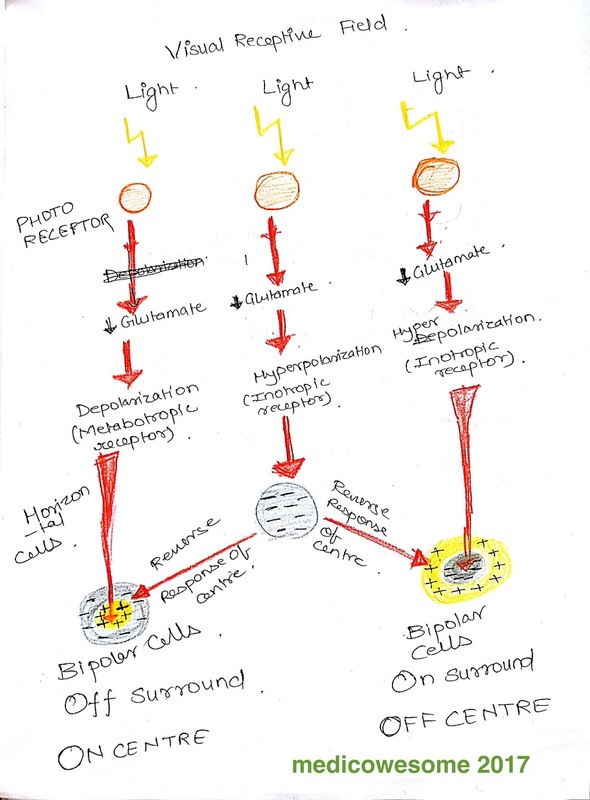 Because depolarizing and hyperpolarizing bipolar cells lie immediately against each other, this provides a mechanism for separating contrast borders in the visual image, even when the border lies exactly between two adjacent photoreceptors. We will take a simple example. Suppose light is striking at periphery of two receptive fields. Remember it is shaped like a disk, with a centre and periphery both opposite in nature.Suppose One is On centre bipolar cell and other is Off centre bipolar cell(On centre: Activated when light hits centre but periphery is inactivated and vice versa for Off centre). So only the Off centre bipolar cell will detect it. Hence mixing up of signals is avoided. Again what I get is a sharper border. That is what contrast is all about. That is how it is all done. Interesting fact: The cells in the retina don't follow the "all or none" law. Transmission is by Electrotonic conduction. From ganglionic cell onwards cells follow all or none law.